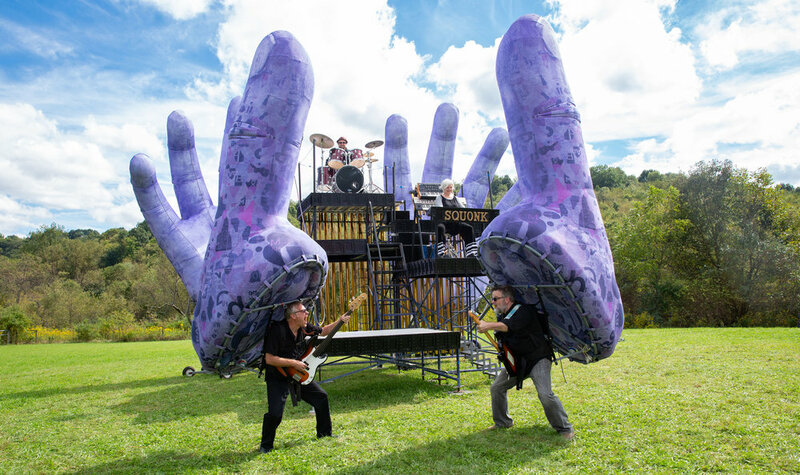 HAND to HAND will be propelled by a pair of giant hands, a metaphor for humanity’s scale and impact. These puppet hands will have the visible rigging of a sailing ship or hot air balloon, and are just as massive. pointing and teasing, pushing, punching, hiding and exposing. pointing, knuckling under, hand off, hand out, mano a mano, hand to hand. Music will rise from a single finger flicking an organ key, as natural an expression of humanity as a wave or a fist. spectacular, plaintive, and comic as the band runs head to head into these overwhelming hands of fate. The Biggest hand puppets in the world! Our show will end with ropes of many colors being passed out to audiences, each moving a different finger, a web of connections. Audience members will come together to grab the rigging, each individual powering a larger movement. no labels, no pre-judgment, no words, just people face to face, festive, and making a community of the imagination. Scale and Agency. How big we are. And what we do. Squonk’s outdoor public music spectacles embrace the festival and civic setting. roaring earthmovers, and screaming machine shears 25 years ago. We focus on creating large-scale, accessible outdoor music spectacles with original music, design, and staging. We also create STEAM workshops, and perform them for thousands of kids each year. Other reviews include “surreal and poetic” (USA Today), “insane majesty” (The Scotsman). Jim Henson Foundation, and many other generous foundations. We have toured to 35 states in the U.S., Great Britain, Belgium, Germany, Canada, China, and South Korea. We have performed for millions, live and on TV. Thank you for checking out our new show, HAND to HAND, set to premiere in Summer 2019. Please contact Artistic Director Steve O'Hearn if you are interested in being a part of the project!